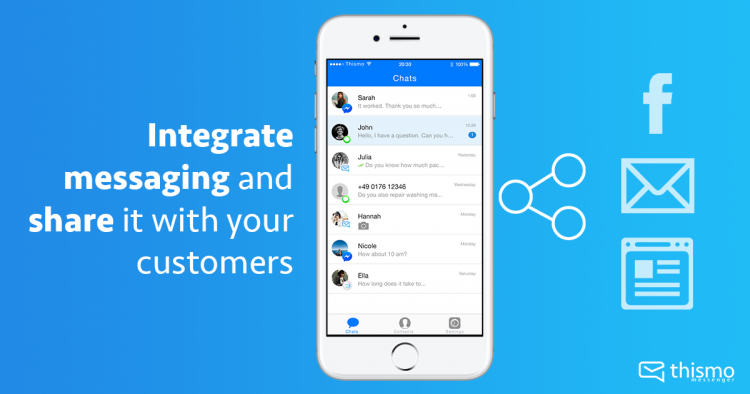 You decided to use our thismo messenger for customer communication and want your customers now to engage with the new channel? Therefore it is important to let your customers know you’re using thismo messenger. Besides all the social networks like Facebook and Twitter, there are also other ways to share your individual thismo messenger profile. You’re sending a weekly newsletter for your customers to engage with your business but how can your readers contact you if there is more information needed? Just attach the link to your messaging profile, so your customers are able to get directly in touch with you for requests. The easiest way of course is to put the link on your webpage. You can either use a direct link or place it on a button. Refrain from a contact form and have a personal chat instead with messaging. You can also put the address of your messaging profile on your invoices. To make it more visible, easier and a little more fancy to interact with you can also export your link as a QR code. When your customers scan the code with their smartphones, thismo opens in their browser. From there the common thismo messenger experience let’s your client start messaging immediately from the browser based messenger or switch to any messenger service you connected with thismo. Beside the direct thismo messenger link, which opens a new tab in browser, you can also integrate thismo as an embedded web chat on your website. It is easy and way better than just a live chat. Insert your thismo username here https://dev.thismo.com/plugin/, choose the integration type, the button style and you receive the code down below to insert in your webpage. Now you are ready for messaging your customers. Respond to all requests easy and personal with thismo messenger. Got an own App? Use our APIs and pre-built responsive UI of Messagile.